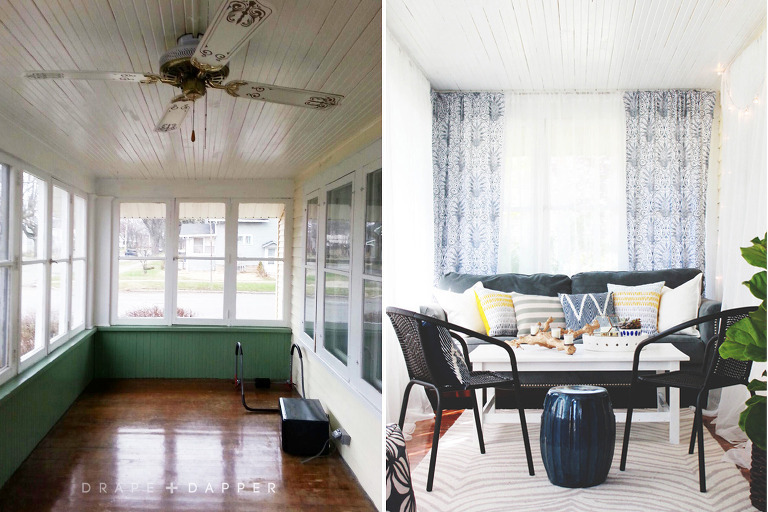 This front porch turned bright + cozy sunroom is the perfect example of drab to fab!! Our friend Jenny moved into this 1920’s character home last year and has since been pouring her heart and soul into making this little gem her own. A fellow style-obsessed gal with a knack for making things pretty, she’s not afraid to get her hands dirty. Most of the updates she has done herself (her boyfriend may have helped a tad along the way) and she focuses on projects that are impactful yet affordable (paint is her best friend). She’s also a bargain hunter and finds most of her decor at places like Target and Home Goods. 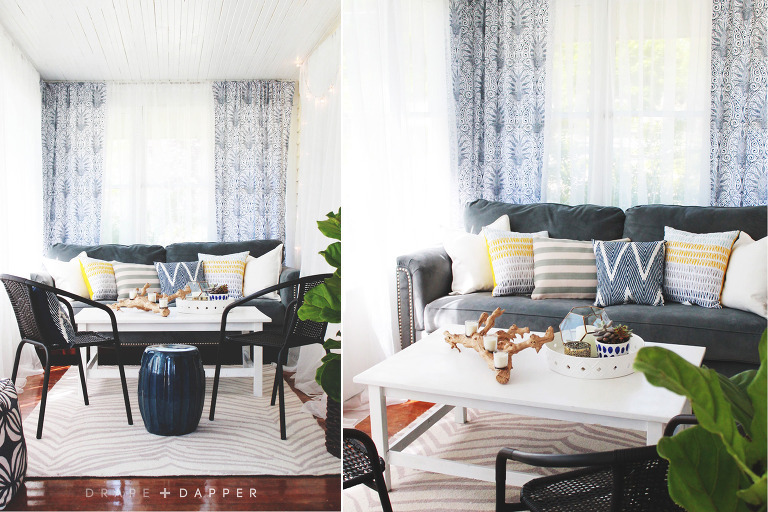 With spring fast approaching, Jenny knew she wanted to do something with the unused front porch space. She lined the perimeter with ceiling height sheer curtains for privacy while still allowing light to filter in, creating a light + breezy feel. 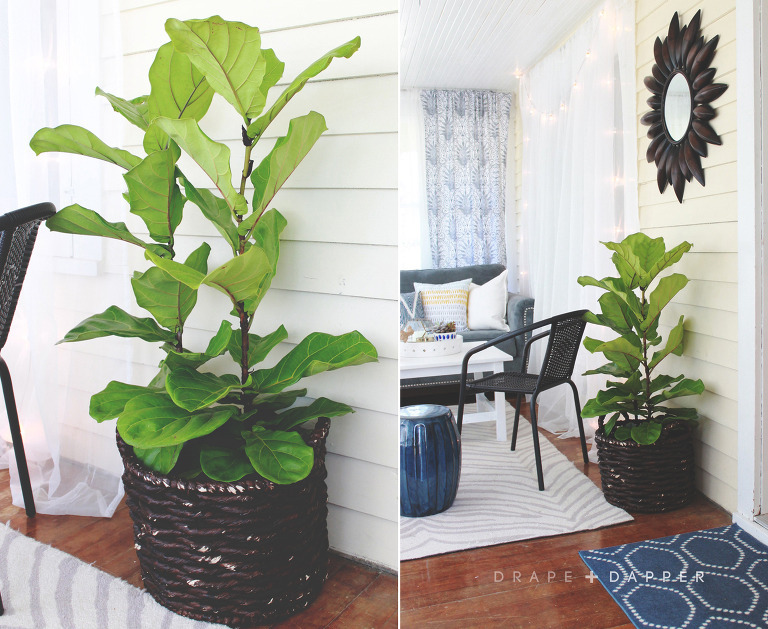 This helped streamline the look and is the perfect backdrop for this cozy setting. 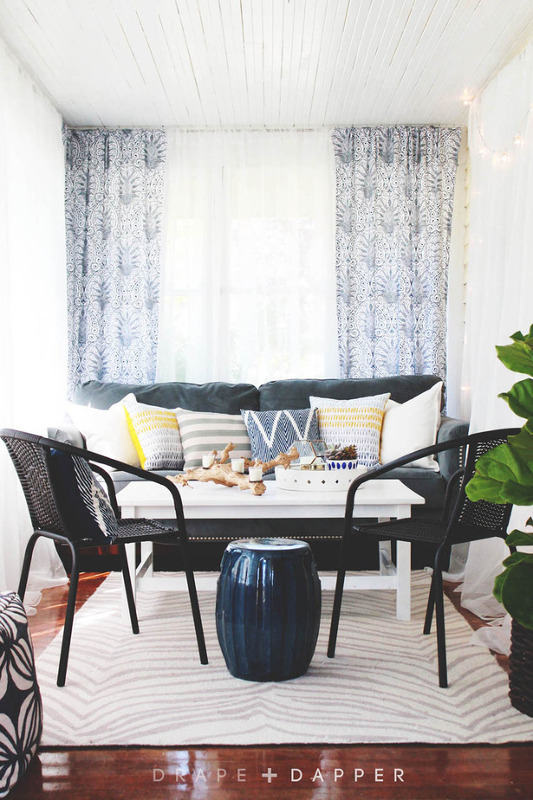 She placed an old indoor couch at the far end of the room with pillows in fun pops of colors, a hand-me-down coffee table and little woven bistro chairs for a cute sitting area. On the opposite side she used a slender custom made console as a bar/entertaining area and across, a bench for extra seating (which happens to be her pooch’s favorite spot). Poufs provide additional impromptu seating and tuck away easily, while adding some extra color and pattern to the mix. And we can’t forget about the accessories; lots of greens, some textural driftwood elements and candle lit lanterns add to the eclectic, beachy vibe. Such a fun + easy update, we hope you enjoy the view!